Kishen Kumar Yadav is a secondary school teacher in Shivdan Singh Pura village, 17 km from Behror, located midway between Delhi and Jaipur. Astride his Bajaj Pulsar, he zooms through the narrow village lanes, which have been transformed into concrete bylanes a few years back. His class has an equal number boys and girls, but lacks fans and there is no clean drinking water. He and his colleagues have to carry their own water, as the available water has a high fluoride content. His house is one of the few in the village that have concrete walls with closed toilets and bathrooms and emulsion painted walls. After school, an hour or two is spend in front of the television, fitted with a cable connection, and Yadav is ready for his next job. Come early evening and this secondary school teacher is transformed into a farmer, tending to his jowar and bajra crops with his wife in tow, preparing fodder for their buffaloes. Yadav is one of the many, almost 50% of the 1,200-odd villagers in Shivdan Singh Pura, who have taken to education as their primary jobs, relegating farming and agriculture to second spot. With the joint family set-up disintegrating and landholding getting divided among generations, it is proving difficult for families to sustain on agriculture alone. And that is the reason why villagers are stepping out in search of jobs. Yadav's elder brother shifted base 15 years back and is now settled in Greater Noida, working in a private firm. "Teaching is one of the popular professions among the villagers, as it gives people like me enough money and time to pay attention to both my job and my fields," says Yadav. His co-workers agree and point out that for a farmer, it is difficult to survive on agriculture alone. This rural transformation is supported by the fifth Economic Census (2005) carried out by NSSO, showing rise in non-farm activities and associated employment in rural areas. The growth rate of such activities in rural areas is higher as compared to the growth rate in urban areas. The Census shows that there are about 25.81 million enterprises in rural areas, constituting about 61.3% of the total enterprises in the country. These rural enterprises are clocking an average annual growth of about 5.53% and employ more than 50 million people (51% of the total). Further, rural enterprises are recording an average annual growth of 3.33% in total employment, which is higher than the growth rate of employment seen in case of urban enterprises. CSO's Economic Census 2005 indicates that about a fifth of the non-farm rural workforce is employed in agricultural establishments, while four-fifths worked in non-agricultural establishments. With diversifying livelihood options and increasing earning opportunities, social conditions are also improving. TV with cable connections, mobile phones, cooking gas and electricity have become integral to every household. Despite presence of cattle, dairies have also sprung up in the village. "We keep the quantity of milk that is enough for our consumption and sell the excess at these dairies and earn money," says Yadav. Some have also started buying milk pouches, lassi and chach from the dairies, a concept unknown a couple of years back. The dramatic shift in urban diet and booming food processing industry catering to the local and global demand for many of the same products has led to farmers diversifying into higher-value crops. Apart from the traditional jowar, bajra and sarson, farmers are also experimenting with cotton, arhar and onions in Shivdan Singh Pura. Professor MS Swaminathan, chairman, MS Swaminathan Research Foundation, illustrates how similarly in Kerala, everybody started growing vanilla, since its cultivation in the beginning gave a substantial income. "However, when many people planted vanilla, the prices crashed. Then the farmers took to rubber cultivation. Unfortunately, there is no mechanism to provide timely land use advice based on meteorological and marketing factors," he adds. Erratic rainfalls and experimentation has led to the disappearance of some traditions crops. Case in point is the disappearance of the black gram (chickpea) crop in Yadav's village. Lack of rains led to the crop vanishing in the area. People have started growing wheat and mustard instead. "Growing chana was a profitable option for us. It did not require much investment and efforts and we could easily make a profit out of it," recalls Yadav. Government data for three crop years up to 2006-07 indicates that cultivating cereals is unprofitable for farmers across most states. The worst return comes from rice cultivation, the largest sown crop across India and under the support-price regime for decades. Data on the net return foror income earned byrice farmers shows they have suffered losses in all the major paddy producing states, except Andhra Pradesh. Though the scenario is a bit more optimistic in the case of wheat, the figures are bad for coarse cereals like jowar and bajra. "Land-based livelihood became unsustainable and crop diversification for small holders is an expensive proposition, forcing small and marginal farmers to look out for alternatives like non-farm activities and livestock. NREGA is another opportunity that has helped small farmers. In a few states, NREGA offers higher pay than farm-related activities. Migration to urban regions, which was otherwise high, has been contained to some extent by NREGA," says Lokesh V Ayireddy, consultant, BPS Division, KPMG. Rising level of entrepreneurship in rural enterprise is another striking factor, indicated through low number of hired workers (presently standing at about two-fifth of total persons employed). 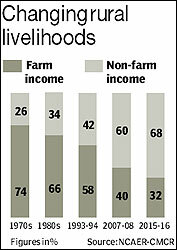 These numbers indicate that a trend of diversification away from farm activities is taking place in rural areas. This is supporting income levels, as well as bringing in an element of stability in the income flows accruing to the rural populace. A growing trend that is supporting this shift is the surge in the number of rural BPOs that are gaining prominence. Nasscom estimates present an astounding growth. From about 50 rural BPOs, employing about 5,000, the 2015 projections put out by 11 rural BPOs (the industry size today) indicate at about 1,000 centres and 1,50,000 employees. This shift from agrarian economy has transformed most of rural India. Though islands of poverty still exist, the growing service industry has infused a new lease of life in the rural heartland.